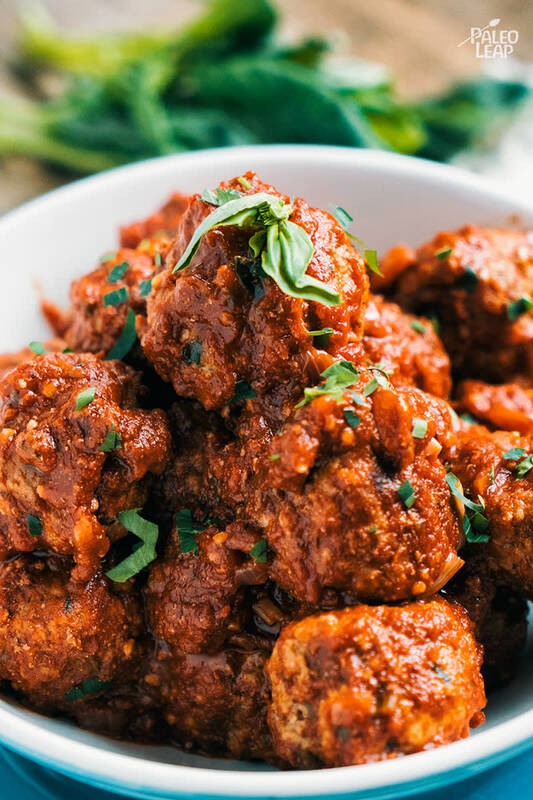 Skip the Parmesan and the breadcrumbs, these Paleo meatballs have another story to tell – and you’ll be delighted to know that it has a delicious, happy end. It may seem like a lot of ingredients are going into this dish, but have no fear, they are what holds everything all together; after all it is flavor and satisfaction what we are after, not processed, ready-to-eat stuff with a questionable-many ingredients. What you make at home is always best, so mix that ground beef and pork, add the almond meal and the dried herbs, then get to rolling those meatballs! Let’s talk marinara sauce. You can buy a jar at the store, but it won’t ever be the same as homemade. In a pinch it works, we can’t always fight time. Though those fresh herbs, and the nutritious chicken stock? Those may be missing, so if you do happen to have the time, it is definitely worth making your own. These amazing meatballs also call for almond meal. While we don’t recommend skipping this ingredient, if you need to opt out, why not try some coconut flour instead to keep it nut-free? Where there is a will, there is a way – and in the case of meatballs, you are going to find a way to enjoy them. What to enjoy them with? Well, they are absolutely perfect on their own, one by one, out of the pot. If you are somewhat of a modern traditionalist, you can modify your pasta choice and spiralize a large pot of zoodles instead. In a bowl combine all the ingredients for the meatballs and season to taste. Mix everything well and form equally shaped balls of about 2 inches. Melt cooking fat in a skillet over high heat. Brown the meatballs on all sides until nicely browned, 4 to 5 minutes. Set aside. For the marinara sauce, heat the olive oil in a skillet over medium-high heat. Add the onion and cook until soft and translucent, 4 to 5 minutes. Add the garlic and cook another minute, pour in the chicken stock and scrape the bottom of the pan. Add all the remaining ingredients, bring to a light simmer, lower heat and simmer 10 to 12 minutes. Add the meatballs to the sauce, toss everything gently and continue cooking stirring about 15 minutes, or until meatballs are cooked all the way through.